No trip to Barcelona would be complete without visiting Sagrada Familia, so that’s where we started. Sagrada Familia is a massive basilica designed by Antoni Gaudi. It’s been under construction since 1882 and won’t be completed for at least another decade. Their goal is to complete the entire thing in 2026, to celebrate the centennial of Gaudi’s death, but I think that’s a rather ambitious goal. The construction is a private contract, and many things have contributed to the length of its construction. Funding will always be an issue for a building of this magnitude, but even more problematic was the Spanish Civil War. Plans and photographs were stolen, and sections of the church were destroyed. Luckily, construction continues, and the entrance fees to visit the church are contributed to the building fund. Even though it’s not complete, it was recently declared a UNESCO World Heritage site. It’s a stunning building, inside and out. You could stare at it for days and never see all of the details. Each and every piece of the cathedral represents something, from the number of pillars to the style of the façades. We arrived at the Passion Façade, which was K’s favorite portion of the exterior. As expected, it depicts the Passion of Christ, but we would have missed half of the details if we hadn’t spent the extra 3 euro on the audio guide. For example, on one section of the wall is a series of numbers that is actually a puzzle. No matter how you add up the rows and columns of numbers, they always equal 33, or Jesus’s age when he died. All of the sculptures on this façade are sharply carved and free of ornamentation. The entire wall appears stark and skeletal, but it’s oddly attractive. 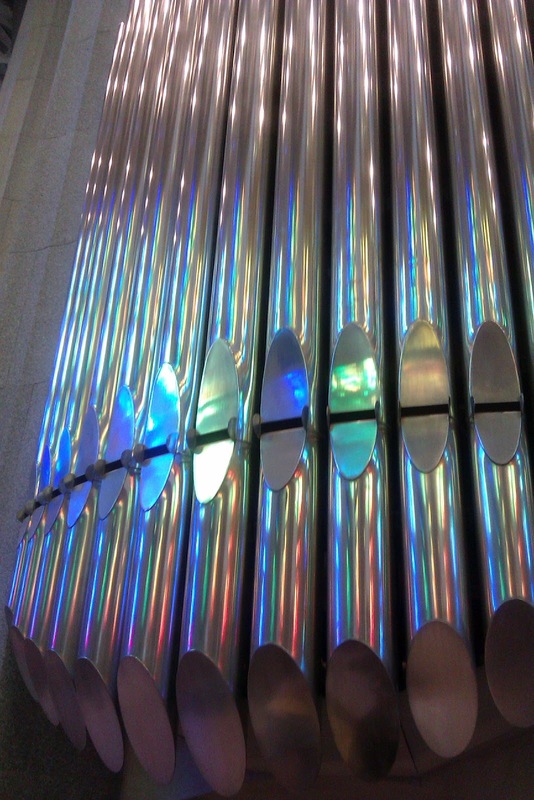 Inside, it’s a cascade of colors and columns. Gaudi’s love of nature can be seen in every detail, from the way the pillars resemble a forest to the spiral shell staircase that seemingly reaches towards the heavens. 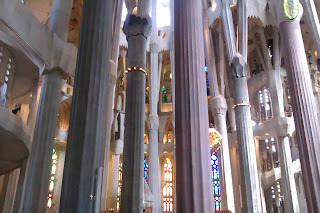 The columns are meant to look like a forest. I’ve visited more cathedrals than I can count, in several countries, and nothing prepared me for the beauty of this interior. I can’t put into words how gorgeous this structure is, and pictures just can’t do it justice. 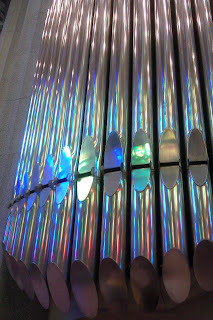 Light from the stained glass reflecting off the pipe organ. Catholic or not, this basilica will leave you speechless for a moment. You can view the official image gallery of the building here. We exited through the Glory Façade, which will eventually be the main entrance to the church. On the massive door, you can read “Our Daily Bread” in 50 different languages. We wrapped around to the Nativity Façade, which is the busiest looking section of the church. 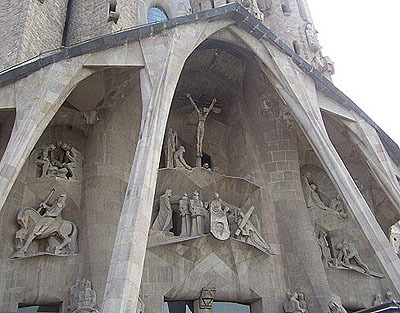 It is literally covered with sculptures and decorations, which is meant to be a contrast to the Passion Façade. Everywhere you look you see trees, animals, and scenes of Jesus’s birth and childhood. Above all of this stands a sculpture of the Tree of Life, with doves nesting in the branches. We spent almost 3 hours at Sagrada Familia, and I can’t wait to return. I would love to see the finished product, so I guess we’ll be returning to Barcelona in 15 years or so.